Louise Hearman is Australia’s leading practitioner of the uncanny. 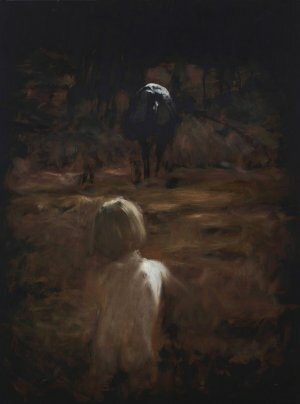 Her paintings invite the viewer in with a beautiful and familiar point of reference – a landscape; an animal; a portrait – only to have this initial illusion broken by a startling, at times sinister point of contrast – a legless figure floating above a moor; or the face of a child emerging from the anthers of a flower. It is this irrational and inexplicable characteristic that gives Hearman’s work its seductive quality. Stemming from a school of artists out of Melbourne who deal with the darker side of life – Albert Tucker, Peter Booth, Bill Henson to name a few – Hearman since her first exhibitions has created a unique, almost gothic style with a vocabulary of potent symbols, bold, painterly brushstrokes and a masterful control of light. Taking after the surrealists, Hearman is candid about the automatic nature of her process saying that often while painting “You wake up half-way through and wonder what you’ve been doing.” That surreal tendency, and especially the pairing of nature with young girls, is reminiscent of Dorothea Tanning, with whom Hearman shares a fascination with the disquieting and the bizarre. Louise Hearman studied at the Victorian College of the Arts, Melbourne, and began exhibiting in 1987. Most recently, a major solo exhibition ‘Louise Hearman: Against the Grain’ was held at the Museum of Contemporary Art, Sydney, 2016. In 2016, Hearman received the Archibald Prize, Art Gallery of New South Wales; and in 2014 she received the Doug Moran National Portrait Prize. Her work has been collected by state and regional galleries, and her work is represented by Roslyn Oxley9 Gallery, Sydney and Tolarno Galleries, Melbourne.